Super monogrammed blue bath towel. Super monogrammed blue bath towel. 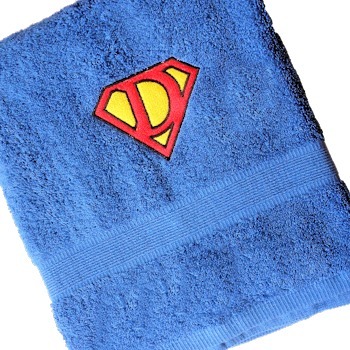 Any single initial embroidered in this superman like styled monogram. This bath towel is made from soft cotton 500gsm weight. This bath towel is made from soft cotton 500gsm weight. A lovely gift for yourself, family or a friend. Optional Ribbon Presentation: For a small additional fee we can tie this towel with a personalised printed ribbon. Select the Personalised Ribbon option and enter the brief message you would like on the ribbon. A great way to say who the gift is to and from. Or perhaps just say Happy Birthday, Happy Fathers Day or other special occasion.